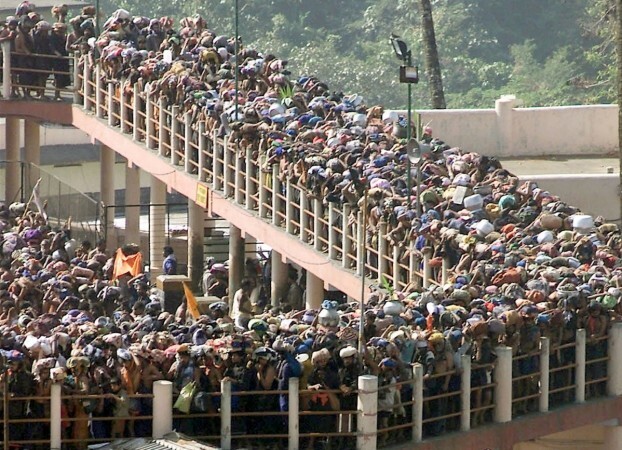 Main pilgrim season in Kerala's hill shrine enters the second day amid tension and high security. Tensions continued to reign high over Kerala's Sabarimala temple for the second day on Sunday after it opened for the main pilgrimage season on Saturday amid high security. Prohibitory orders are in force in and around the holy site of Hindus, which has seen violence and police action in the wake of a Supreme Court order allowing the entry of women of all ages. Local television channels were showing much more peaceful temple premises on Sunday when compared to the two times it briefly opened earlier, though the number of pilgrims has fallen sharply because of police restrictions and protests on the route to the temple. The Kerala state unit of the Bharatiya Janata Party (BJP) has called for statewide protests against police action and the arrest of its leaders. The party's shut down on Saturday led to sporadic violence and stopping of vehicles. A magistrate's court remanded its state general secretary K Surendran in police custody early on Sunday morning. He was arrested on Saturday afternoon from the Nilakkal base camp on way to the temple. Police slapped non-bailable charges including the attempt to obstruct their work on Surendran. Police had to use force on Surendran after he resisted the arrest. The state saw overnight protests including tension in front of the government secretariat following the arrest. Security forces used water cannon and mild cane charge to disperse BJP workers there. Earlier, KP Sasikala, a Hindu right-wing leader, who was arrested on her way to the temple on Saturday, was later freed on bail with the instruction that she should not remain on the temple premises after offering the prayers. The Communist Party of India-Marxist (CPM)-led government has maintained that the BJP and the main opposition Congress party are trying to make political gains out of the situation arising from the Supreme Court's order allowing the entry of women of all ages into forest shrine. Congress party's state unit announced that its leaders will be visiting Sabarimala from Sunday to assess the situation. The temple will remain open for the Mandalam season until December 27 until it closes after the Mandala pooja. It will reopen for Makara Vilakku festival on December 30 and close on January 14. Many pilgrims continue to complain about the inadequate amenities at Pampa from where the pilgrimage is on foot. The government has not been able to complete the reconstruction of the facilities that were destroyed by the devastating floods earlier this year. The state transport corporation is running buses between Nilakkal and Pampa in security convoys. Private vehicles are not allowed beyond Nilakkal. The government has deployed police in force fearing untoward incidents as hundreds of women devotees within the 10-50 age group have sought protection for safe temple visit. The protesters have declared their intention to stop any woman within the 'menstruating age' group from visiting the temple. Tensions were mounting since Friday when a group of protesters staged a sit-in in front of Kochi's Nedumbassery airport to prevent activist lawyer Trupti Desai from visiting the temple. Desai and her aides were forced to return to Delhi by flight after more than 16 hours in the terminal building. Police have registered cases against about 200 people who staged the protest on the airport premises, citing security reasons.